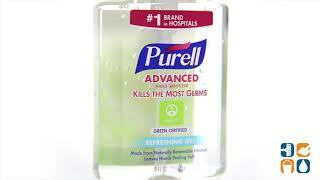 The world’s first Green Certified hand sanitizer. Helps condition skin with a natural moisturizer. Made from 100% naturally renewable ethanol. Readily biodegradable gel formula. This product meets the Eco-Logo environmental standard for instant hand antiseptics based on its use of less intrusive raw materials, a reduction of environmental hazards, and an increase of product recyclability. Meets the Eco-Logo hand sanitizer standard CCD-170 for environmental leadership and proven performance. Meets the USDA Bio-Preferred program for bio-based content. Qualifies as a USDA Bio-Preferred product for federal preferred procurement. 8-oz. pump bottle, 12 bottles per Carton.